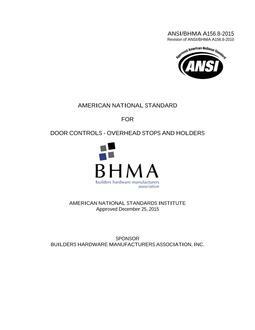 These Standards cover all significant dimensional attributes for mounting common hardware products in steel doors and frames. All dimensions shall be shown on the accompanying drawings. These standards were developed to show only the most commonly used preparations for door hardware, and provide targets for standardization. Where multiple configurations are in common usage, separate drawings are provided. For other configurations, it is recognized that these standards may be used in part, or with exceptions, while still providing some degree of basic guidance and standardization.